Beaten and wounded by a band of sadistic renegades that rules the borderlands of Indian Territory, U.S. Marshal Kaed Turner understands what the inevitable outcome will be for him: death. But Fate and a war party of Choctaw Indians intervene, delivering him instead to a beautiful angel with the skill to heal him. Jessica Monroe has already lost a husband and a brother to the outlaws who tortured Marshal Turner. As the rugged lawman lies bleeding on her bed, she faces a difficult decision. Can she afford to gamble with her heart one last time? For when Kaed recovers, he is sworn to join the other Territorial Peace Officers in their battle to wipe out the renegade gang once and for all. When vengeance is done, will Kaed keep riding? 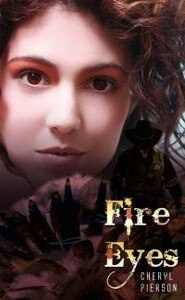 Or will he return to claim his future with the beautiful woman the Choctaw call FIRE EYES? I live in Oklahoma City with my husband of over 30 years. I have two grown children, Jessica, who is a wonderful artist, and Casey, my son, who is either always at work or in school. I have a freelance editing business and also teach fiction writing classes in the Oklahoma City metro area to all age groups. I've worked extensively with one of the local school districts in their Indian Education Department as a tutor and fiction writing workshop presenter. I love to talk writing with other writers and readers. I'm a classically trained pianist and used to teach that, too. Now I seldom get to practice like I should. Before I published FIRE EYES this past May, I wrote and published many short stories through Adams Media ("Rocking Chair Reader" series) and Chicken Soup for the Soul. I don't have a pen name. I figure, I've worked hard enough to get to this point, I want people to know my name! You write romantic tales from the heart. How do you feel about your books and your career so far? FIRE EYES went on to become an Epic Finalist, and sometimes when I read it I have trouble believing I wrote it. I sometimes get so engrossed in my characters, and what they are saying and doing that I will go back and read over what I've written and actually won't remember parts of it. But I really do love this story, and for it to have become a finalist in the EPIC Competition is just unbelievable for me. Although it didn't win, it was a great honor to be included! Tell us about TIME PLAINS DRIFTER, your second novel. 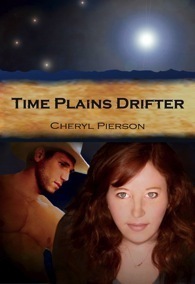 TIMES PLAINS DRIFTER is a unique time-travel--and a PNR Paranormal Romance Reviewers Top Pick for November 2009--with ruggedly handsome angels and demons with deadly tricks to twist fate. Substitute teacher Jenni Dalton is flung backward in time 115 years with seven of her students when a comet passes close enough to Earth to rearrange the bands of time. They find themselves in 1895, Indian Territory with no way back to 2010. U.S. Territorial Marshal Rafe d'Angelico was murdered, along with his brother, sixteen years earlier, in 1879. Now, he finds himself a reluctant angel, brought through time to help Jenni Dalton and her students escape the Dark One who is after one of them. But which one? And for what evil purpose? Rafe only knows he doesn't want to be an angel, now that he's found the woman he wants to spend his life with. Keeping one step ahead of Satan's man who's teamed up with Rafe's murderer proves to be the hardest thing he's ever faced--until he's forced to choose between saving the woman he loves and spending eternity in a Hell of his own making. Will love be strong enough to save the Time Plains Drifter? This story came out of a desire to write something that my agent (at the time) would be able to sell. My first western was way too long, and the second one I wrote was shorter, but still not short enough. This book, TIME PLAINS DRIFTER, was an idea that came to me from the desire to write something really different that would be intriguing and different. At the time I started it, I didn't realize how hard it was going to be for a "pantser" like me to make it all come about as it should with the time travel and paranormal elements. This cover is really special to me because my daughter, Jessica Pierson, was my cover artist. This is the first cover she's ever done for me, and I'm so glad we got to work together on a project. We've talked about it since she was a little girl, and it's one of those "dreams come true." 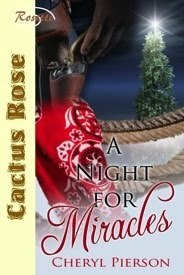 "Night for Miracles" is a Cactus Rose release for The Wild Rose Press. Tell us about Nick and Angela. Angela Bentley is a widow in post-Civil War Indian Territory. On a snowy Christmas Eve, just at dusk, she takes in a wounded gunman and three children that are traveling in the raw cold. Nick Dalton, the outlaw, is wounded as much emotionally as he is physically. Angela discovers that things are not always what they seem, and that Christmas Eve will always be "A Night for Miracles." Your heroes usually need mending by the heroine. What’s the story behind hurting these strong adorable guys? I'm not really sure what that says about me! I think for me, it's a gambit of putting the hero in a position where he must depend on the heroine. Lord knows, he wouldn't in any other circumstance. My guys are usually so hurt and closed up emotionally that being dependent on the heroine is the catalyst that makes them realize they can find love again--or for the first time. What are your current projects and works in progress? Right now I have three things in the works. One is a contemporary romantic suspense involving a drug cartel and two DEA undercover agents, both of whom unknowingly have a connection to the heroine-- and boy, are they in danger every second! The second thing I am working on is another western historical romance, GABRIEL'S LAW. And last but not least, a little short story that would not leave me be until I sat down to write it, "Scarlet Ribbons," which involves a cowboy's bid for redemption when he finds out he's the father of a little girl who's blind. It's a Christmas story with a paranormal element in it, and will be released through Victory Tales Press in one of their Christmas anthologies for 2010. I have two blogs that I semi-maintain, one which is mainly about my books and writing, and one which is mainly about the information and history of the old west. Thanks for stopping by today, Cheryl, and best of luck with your career! For readers who'd like a chance to win one of two copies of "A Night for Miracles," please leave a comment or a question. Maybe: Do you fancy the idea of paranormal or time travel elements in your Westerns? We'd be curious to know! I'll draw a winner at random next Sunday. Void where prohibited. Best of luck to everyone!